We love Pachamama in Todos Santos because there’s something magical about the way that the desert meets the sea here. Cactus, palm trees, dry desert air, misty ocean beach, it all comes together in such harmony and beauty here we just can’t get enough. Plus you get to see whales every single day when you go in January! You can join us on our annual yoga retreat in Todos Santos, January 7-13, here! You’re in for the best week of eating of your entire life paired with Mezcal, nature and one of the best yoga/movement teachers in the world. This city is amazing and you don’t want to miss this once in a lifetime retreat. You can join us on our most exciting yoga retreat of the year, our Oaxaca Yoga Retreat, January 14-20, HERE! Just an hour south of Mexico city, this gem of a healing center is surrounded by an epic mountainscape and wisdom from the local indigenous cultures. Go for the weekend or go for a weeklong retreat and treat yourself to something special in a magical place. One of the few places that you won’t be surrounded by wifi waves or people on their cellphones, the ability to disconnect here is only outweighed by how epicly beautiful the retreat center is. 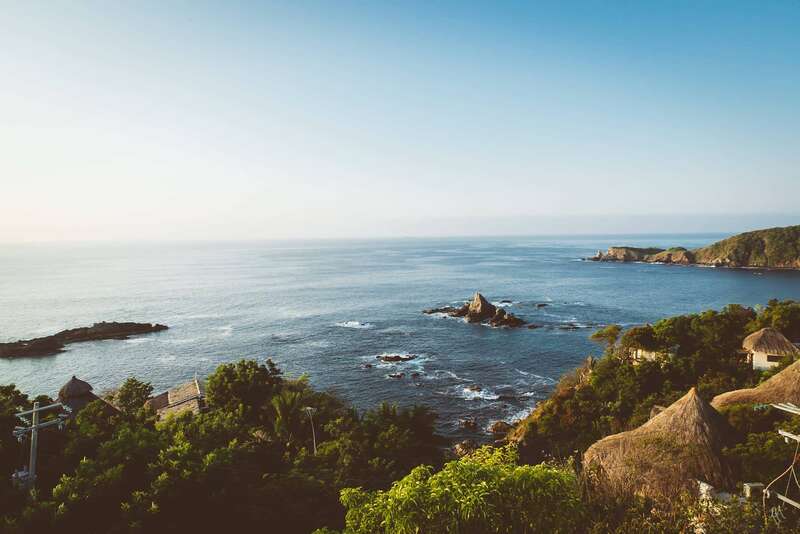 If you’re looking to disconnect and be immersed in beauty, this yoga retreat in mexico should be in the running. Xinalani is one of the hands down coolest retreats centers we’ve been to. You can only arrive by boat and each casita is nestled into the side of the mountain. There’s an incredible temezcal on the beach and the food is incredible. Playa viva is slowly growing into one of the most beautiful and inspiring yoga retreat destinations in the world. We can’t wait to plan a retreat there and you’ll be the first to know when we do. Unlike other retreat centers in mexico, Hrydia is an ashram dedicated to teaching and learning tantra and other practices of the heart. This is the place to go to deepen your practice while immersing yourself in beauty. Another retreat in Baja, Prana del mar is a go to for retreats south of the border. Check it out for some of the biggest name teachers in the world! As Tulum is becoming more and more popular with regular tourists, Holbox is becoming the go to spot for travelers who want an authentic island experience. There’s just nothing like the bohemian vibe of Tulum. The beach is to die for and the restaurants are world class. We are excited to have found Nomade hotel and can’t wait to plan a trip down there. We only work with venues that we ourselves would want to go on retreat to and we only want to work with places that have that extra touch. Sometimes the extra touch comes in the way of incredible hosts, sometimes it's the food, sometimes it's the location or even the yoga studio. We hope that the extra touch is found in all elements and invite you to join the adventure as we explore the world's best retreat centers, farms and hotels and share them with you here. The Yogascapes Destination Guide provides an insider's glimpse into the world's most unique, restorative retreat destinations. We go off the beaten path to invite you to one-of-a-kind places that you can call home. From eco-resorts on the beach to villas on mountaintops, we find you the best.